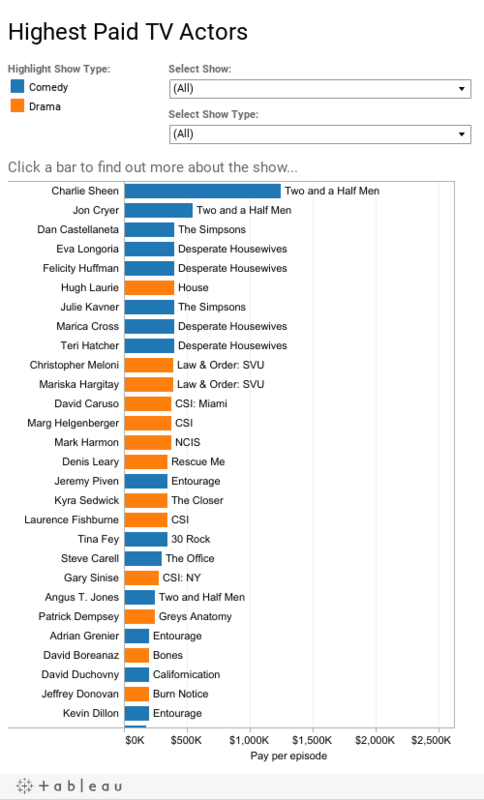 This simple but fascinating view shows the highest paid actors in television. As you might expect, there are some serious outliers. Charlie Sheen, as has often been reported, rounds out the top of the list with $1.25 million per episode. Generally speaking, lead actors in popular shows seem to command anywhere from $150k to $400k per episode- with the bulk landing somewhere around $250K. Not bad for a weeks work! Filter the view down to a specific show, or type of show with the filters at the top. Click on a bar to find out more about the show from BuddyTV. Thanks to FlowingData for the data. Too much text on this viz. Too much text on this viz. Check out Dan Murray's version on the Data Revolution blog. Cant believe Sheen was pulling down that much per episode. The other surprise was all of the desperate housewives people on there. Really?